Syracuse lacrosse midfielder Bobby Eilers and ESPNLA’s Dave McMenamin talk Syracuse sports with hosts Robbie Gillies, Micah Tannenbaum and Wesley Cheng on The Juice on the Cuse podcast hosted by SNY. Syracuse lacrosse defenseman Brian Megill and SBNation’s Sean Keeley talk Syracuse sports with hosts Robbie Gillies and Wesley Cheng on The Juice on the Cuse podcast hosted by SNY. Syracuse attackman JoJo Marasco talks Orange lacrosse with hosts Robbie Gillies, Micah Tannenbaum and Wesley Cheng on The Juice on the Cuse podcast hosted by SNY. Fox Sports and Scout.com recruiting analyst and CuseNation.com publisher John Garcia Jr. talks about Nerlens Noel’s recruit with hosts Robbie Gillies and Wesley Cheng on The Juice on the Cuse podcast hosted by SNY. SNY analyst and former Providence head coach Tim Welsh and Syracuse lacrosse attackman Tim Desko join hosts Robbie Gillies, Micah Tannenbaum and Wesley Cheng on The Juice on the Cuse podcast hosted by SNY. 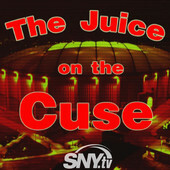 SNY analyst and former Syracuse assistant coach Tim Welsh and 2002-03 team basketball team member Andrew Kouwe join hosts Robbie Gillies and Wesley Cheng on The Juice on the Cuse podcast hosted by SNY. Syracuse lacrosse goalie Matt Lerman and Rush the Court editor Brian Goodman join us in the inaugural Juice on the Cuse podcast.